Matthew Grimes is a 2010 Graduate of Mill Creek High School where he pitched for head Coach Doug Jones. While at Mill Creek, he gained many honors such as 2010 Gwinnett County Pitcher of the Year. In his 2010 season, he was 9-1 in 69 innings pitched with 101 strikeouts. After a successful 2010 season, Matthew was selected by the Chicago White Sox in the fourth round but opted for an education at the Georgia Institute of Technology. As a freshman at Georgia Tech he found himself in the mid-week starting role under head coach Danny Hall. His following season, as a sophomore, he succumbed to an elbow injury that would ultimately end the rest of his season and require Tommy John surgery. After making a full recovery, Matthew was able to return to the field for the Yellow Jackets in 2014. During his time at Georgia Tech, the Jackets won two ACC Championship titles. Matthew was selected by the Baltimore Orioles in the 2014 draft and is currently a pitcher for their Double-A affiliate in Bowie, Maryland. 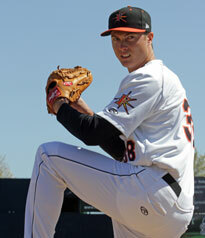 This past season Matthew was both the Carolina League and Orioles pitcher of the month for the month of May. He was also twice the Pitcher of the Week in the Carolina League as well as a Carolina League All-Star. Between Double-A and High-A, he had a cumulative ERA of 2.80 in 138.1 innings pitched with a record of 11-9 in his 2016 season. Matthew also coached for Team Elite.